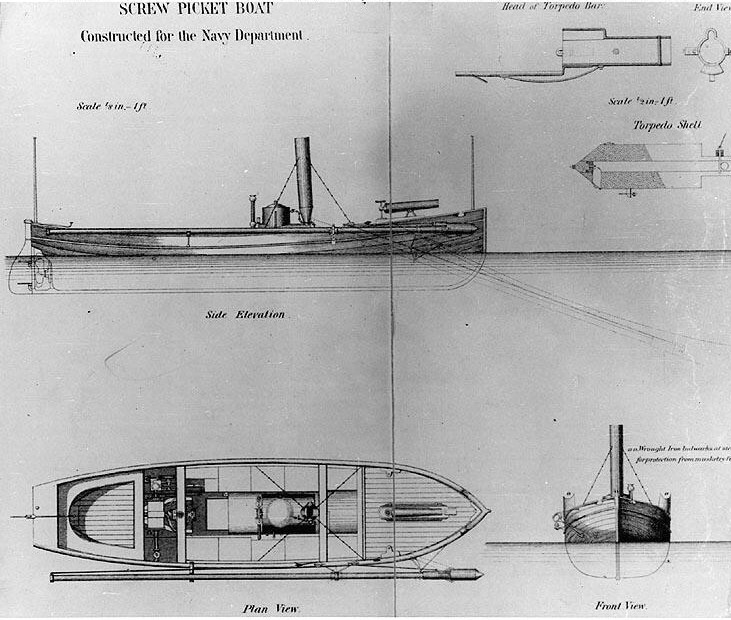 Screw Picket Boat Constructed for the Navy Department General arrangement plan published in "Submarine Warfare, Offensive and Defensive", by Lieutenant Commander J.S. Barnes, USN, 1869. The drawing also includes detail drawings of the spar torpedo carried by this boat. This craft is similar to Picket Boat No. 1, which was used by Lieutenant William B. Cushing to sink the Confederate ironclad Albemarle on the night of 27-28 October 1864. U.S. Naval Historical Center Photograph. There were, to be sure, brave men on both sides of the conflict and while those defending their homes should always be given the greatest accolades there were those fighting for the north who proved their bravery time and again. Typical in more ways than one was William Barker Cushing. Although dismissed from the Naval Academy before the war he garnered a commission at the opening of hostilities – possibly because of his brother, a West Point graduate, and turned the reckless disregard for authority into an asset under fire. His brother was made of much the same stuff and gained fame at Battle of Gettysburg by staying at his guns, even though horribly wounded, during Pickett’s Charge. His last act was to fire off his last gun before being struck in the mouth by a mine bullet, killing him. They are buried, respectively, at West Point and Annapolis although there is more than a little irony in the latter choice. Following the Civil War, LCdr. Cushing was executive officer of USS Lancaster and commanding officer of USS Maumee. Promoted to Commander in 1872, he was captain of USS Wyoming in 1873-74. In November 1873, he boldly confronted Spanish authorities in Cuba to save the lives of many passengers and crew of the steamer Virginius, which had been captured bringing men and supplies to Cuban revolutionaries. While serving as Executive Officer of the Washington Navy Yard, DC, Commander Cushing’s always delicate health gave way and he died on 17 December 1874. And yet Commander Cushing’s reputation was not increased for it was not long after the war that his friends were pained to observe unmistakable signs of mental unsoundness in the young hero. These increased until his brain was all askew, and he died in an insane asylum in 1874. We have heard that the victor writes the history but if they pour this much whitewash on a mere lieutenant what can we believe of what they say about flag officers? Dismissed from the U.S. Naval Academy in early 1861, William Barker Cushing nonetheless emerged from the Civil War as one of the Navy’s greatest heroes. Cushing transformed his reputation from a rabblerouser into a living legend, because he embodied the special qualities that the Navy demands of the men in whom it entrusts its most hazardous and secret tasks: a readiness to volunteer for dangerous assignments, an unflagging devotion to duty, and more than a fair share of good fortune. As Schneller observes, “He was patriotic, aggressive, tough, and recklessly bold.” Before embarking on his most daring mission – his celebrated destruction of the Confederate ironclad Albemarle – he bragged that he would “come out victorious or ‘toes up.’” By the end of the war he had amassed four commendations from the Navy Department and the thanks of Congress and President Lincoln. “All this for a man,” Schneller writes, “who was only twenty-two years old when Lee surrendered at Appomattox.” Employing his customary readable and entertaining style, Schneller focuses on Cushing’s naval career and those aspects of his personality that affected it. "Lieut. 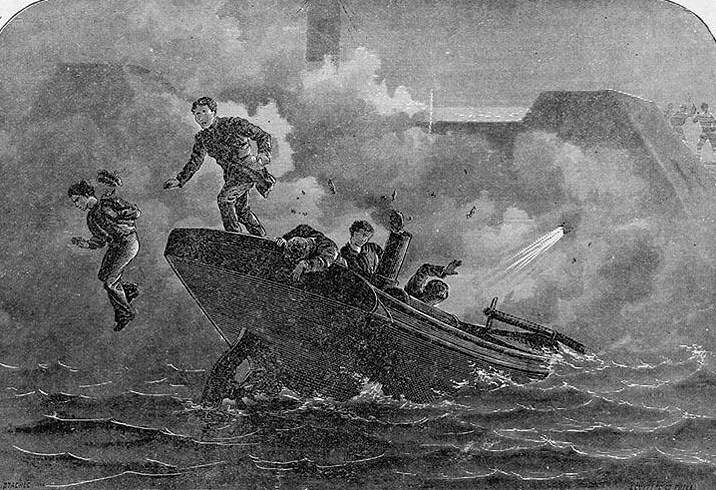 Cushing's Torpedo Boat sinking the Albemarle on Roanoke River, N.C."
Engraving by A. Stachic, published in "Naval Battles of America", by E. Shippen. It depicts the successful spar torpedo attack by Lieutenant William B. Cushing and his crew on the Confederate ironclad Albemarle, at Plymouth, North Carolina, 27 October 1864. U.S. Naval Historical Center Photograph. The distance from the mouth of the river to the ram was about 8 miles, the stream averaging in width some 200 yards, and lined with the enemy’s pickets. A mile below the town was the wreck of the Southfield, surrounded by some schooners, and it was understood that a gun was mounted there to command the bend. I therefore took one of the Shamrock’s cutters in tow, with orders to cast off and board at that point if we were hailed. Our boat succeeded in passing the pickets, and even the Southfield, within 20 yards, without discovery, and we were not hailed until by the lookouts on the ram. The cutter was then cast off and ordered below, while we made for our enemy under a full head of steam. Passing her closely, we made a complete circle so as to strike her fairly, and went into her bows on. By this time the enemy’s fire was fairly severe, but a dose of canister at short range served to moderate their zeal and disturb their aim. Paymaster Swan, of the Otsego, was wounded near me, but how many more I know not. Three bullets struck my clothing, and the air seemed full of them. In a moment we had struck the logs, just abreast of the quarter port, breasting them in some feet, and our bows resting on them. The torpedo boom was then lowered and by a vigorous pull I succeeded in diving the torpedo under the overhang and exploding it at the same time that the Albemarle’s gun was fired. A shot seemed to go crashing through my boat, and a dense mass of water rushed in from the torpedo, filling the launch and completely disabling her. The most of our party were captured, some were drowned, and only one escaped besides myself, and he in another direction. Acting Master’s Mate Woodman, of the Commodore Hull, I met in the water half a mile below the town, and assisted him as best I could, but failed to get him ashore. Completely exhausted, I managed to reach the shore, but was too weak to crawl out of the water until just at daylight, when I managed to creep into the swamp, close to the fort. While hiding a few feet from the path, two of the Albemarle’s officers passed, and I judged from their conversation that the ship was destroyed. Proceeding through another swamp, I came to a creek and captured a skiff, belonging to a picket of the enemy, and with this, by 11 o’clock the next night, had made my way out to the Valley City. Acting Master’s Mate William L. Howorth, of the Monticello, showed, as usual, conspicuous bravery. He is the same officer who has been with me twice in Wilmington harbor. I trust he may be promoted, when exchanged, as well as Acting Third Assistant Engineer Stotesbury, who, being for the first time under fire, handled his engine promptly and with coolness. All the officers and men behaved in the most gallant manner. I will furnish their names to the Department as soon as they can be procured. I desire to call the attention of the admiral and Department to the spirit manifested by the sailors on the ships in these sounds. But few men were wanted, but all hands were eager to go into the action, many offering their chosen shipmates a month’s pay to resign in their favor. CSS Albemarle (1864-1864) 19th Century engraving of the ship as she appeared "ready for action". U.S. Naval Historical Center Photograph. CSS Albemarle, a relatively small ironclad ram, was built at Edwards Ferry, North Carolina. Commissioned in April 1864 under the command of Commander J.W. Cooke, CSN, she almost immediately went into action. On 19 April 1864, Albemarle attacked U.S. ships off Plymouth, N.C., sinking USS Southfield and driving away USS Miami and two other gunboats. With their waterborne communications severed, the Union forces were forced to surrender Plymouth to the Confederates. Just over two weeks later, on 5 May, Albemarle, accompanied by the steamers Cotton Plant and Bombshell, steamed out into the North Carolina Sounds and attacked another U.S. Navy force, consisting of the “Double-ender” gunboats Sassacus, Wyalusing and Mattabesett, converted ferryboat Commodore Hull and small gunboat Ceres. Though Sassacus made a valiant attempt to sink the Albemarle by ramming, she was badly damaged in return. The Confederate ironclad was but lightly damaged in the engagement, which threatened the entire Union position on North Carolina’s internal waters. PLYMOUTH, NC, October 28, 1864. SIR: The night of the 27th instant, a dark, rainy night, I had the watch on board doubled and took extra precaution. At or about 3 o’clock a. m., on the 28th, the officer of the deck discovered a small steamer in the river, hailed her, received an unsatisfactory answer, rang the alarm bell and opened fire on her with the watch. The officers and men were at their quarters in as quick time as was possible, but the vessel was so near that we could not bring our guns to bear, and the shot fired from the after gun loaded with grape, failed to take effect. The boat running obliquely, struck us under the port bow, running over the boom, exploded a torpedo, and smashed a large hole in us just under the water line, under a heavy fire of musketry. The boat surrendered and I sent Lieutenant Roberts to take charge of her. Manned the pumps and gave the order to fire up, so as to use the donkey engine. The water gained on us so fast that all exertions were fruitless, and the vessel went down in a few moments, merely leaving her shield and smokestack out. In justice to myself I must say the pickets below gave no notice of her approach, and the artillery which was stationed by the vessel for a protection, gave us no assistance, manning only one piece at too late a time to be of any service. Having condensed this report as much as I could, I respectfully request a court of enquiry, to establish on whose shoulders rests the blame of the loss of the Albemarle. I am, respectfully, your obedient servant.